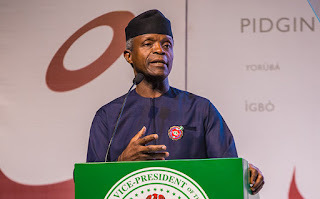 Vice - President Yemi Osinbajo, on Tuesday, said he hated mentioning the name of the ruling party from which the Buhari administration took over because doing so gives him a headache. He accused the Peoples Democratic Party of neglecting Nigerians’ social welfare during its 16 years of governance at the federal level. Osinbajo, who is seeking re - election with Buhari, stated that the administration was feeding 9.2 million children in 26 states every day with its home - grown school feeding programme, adding that the target was 13 million children in the 36 states. According to him, the number of eggs consumed weekly is 6.8 million, creating more jobs for poultry farmers. He further noted that the government had partnered with Brazil to acquire equipment, including tractors and rice processors , to encourage the youths to do more farming. “The money that we are giving traders and small business owners, TraderMoni, we plan to do more in the next level. What we want to do next is PeopleMoni, so that a tailor, for instance , who wants to borrow money without much interest can go to that bank.